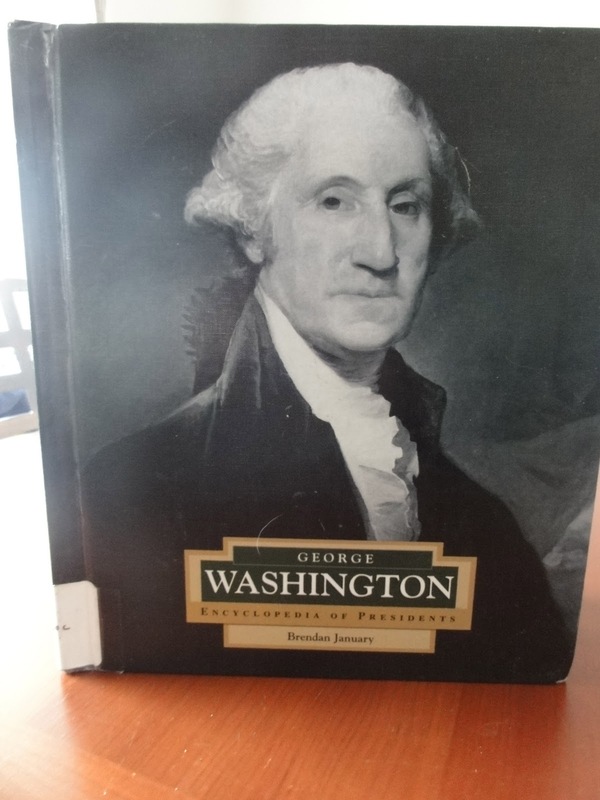 Like generations of American school children before me, one of the first things I learned about George Washington was the story about the cherry tree. Invented by Washington biographer, Mason Locke Weems, the tale describes little George’s inability to lie to his father after cutting down a small cherry tree. * “I can’t tell a lie, Pa.” the boy is said to have responded when confronted with this act, and so, the suggestion goes, the child was father to the man, and our first president was an honest man whose word could be trusted. Would that it were so with all our politicians. With the recent observation of President’s Day I started thinking more about how children now learn about our two most famous presidents. Happily, there are plenty of books around on both Washington and Lincoln. While the POV in books for the youngest children appears to remain largely one of unadulterated admiration, some interesting presentations can be found. George vs. George, for example, by Rosalyn Schanzer, is subtitled The American Revolution as seen from Both Sides. In it Schanzer not only describes the life and times of George Washington, but the vanquished King George III. Schanzer shows that these adversaries were similar in many ways, including in their physical appearance, love of horse back riding and hunting and (originally) their political alliances. Washington had fought alongside the British during the French and Indian Wars. George Washington by Brendan January. With his colorful background and eccentric personality, his leadership in the war that “pitted brother against brother”, the signing of the Emancipation Proclamation, and his tragic assassination, I think that Abraham Lincoln's life and times must be compelling even to those otherwise uninterested in American history. Our enduring fascination with Lincoln is reflected in an impressive statistic—this courageous, brilliant, fascinating, and imperfect man has been the subject of more than 15,000 book. 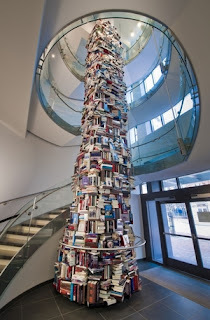 Inspired by this fact, curators at the recently opened Center for Education and Leadership (part of the museum complex in Washington D.C. that also includes Ford's theater) commissioned a 34-foot high tower that appears to be made up of 7,000 books about Lincoln. The tower is actually made of aluminum. Center for Education and Leadership. With this overwhelming number of volumes available, it may be hard for adults to know where to begin (though Doris Kearns Goodwin's Team of Rivals seems like an excellent start.) However, for very young readers, my choice would be Maira Kalman’s Looking at Lincoln. In colorful and striking drawings and just enough text, Kalman tells some of the important stories of Lincoln’s life and encourages the reader to make his or her own connection to this remarkable man. A first look at Lincoln, the man and the leader. Frederick Douglass, both of whom met with Lincoln to discuss an end to slavery. 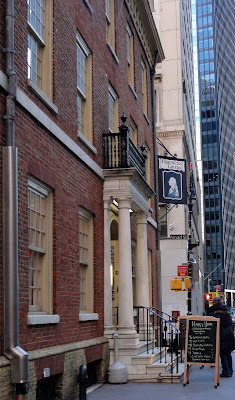 On Monday, February 21, President’s Day, I paid my respects to George Washington with a visit to Fraunces Tavern in lower Manhattan, a restored building on the site where the President said goodbye to his officers at the conclusion of the Revolutionary War. Today the building houses a restaurant and museum. in the Fraunces Tavern dining room. If you want to learn more about Washington’s time in New York City, downtown Manhattan is a wonderful place to tour and sites well worth visiting including Federal Hall (the site of the original building where Washington was inaugurated), Bowling Green—which once contained a statue of King George III, and Trinity and St. Paul’s churches. The National Parks of New York Harbor Conservancy has created a number of publications covering the history of the area. 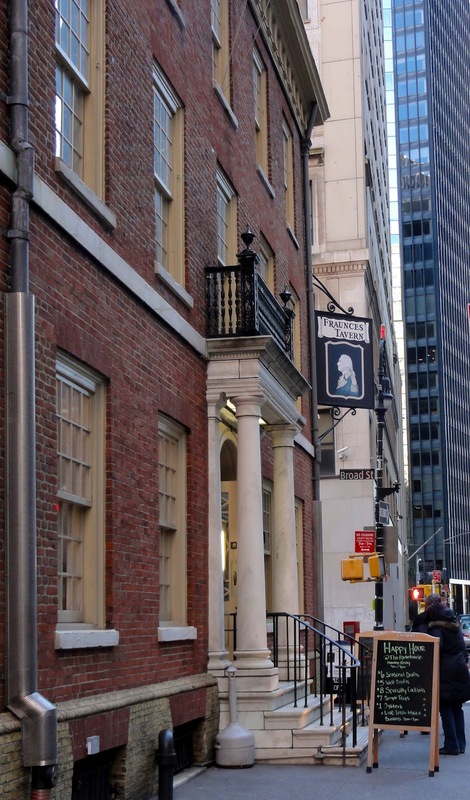 To download their well-written self-guided tour of George Washington's New York, go here. Did you know that Samuel Fraunces may have been black? Widipedia disagrees, but Lawrence Hill, who did extensive research for his great novel The Book of Negroes (US title: Someone Knows My Name) concluded that he was indeed a free black man. That book tower is astounding. A portrait of a white man identified on a nameplate as Fraunces hangs in the Long Room (where Washington made his famous farewell), but a curator has acknowledged that this may not be Fraunces at all, and that there is debate about his race. I think there is a consensus that he was from the West Indies. I hope to see the tower some time this spring. It's been a long time since I've visited DC.